The term "swing" music, referring to the driving beat of the rhythm section of a jazz band, is thought to have been coined by Jelly Roll Morton in his 1906 composition, Georgia Swing. In 1932, Duke Ellington wrote It Don't Mean a Thing (If It Ain't Got That Swing). By 1936, clarinetist Benny Goodman was being called the "King of Swing." In the 1920s, swing dancing became big as young people moved to the jazzy, bluesy, big band music of the time, maybe most famously at Harlem's Savoy Ballroom. This athletic style of dancing came to be called the Lindy Hop, to commemorate Charles Lindbergh's solo flight or "hop" across the Atlantic in 1927. The Lindy of the '30s gave rise to Jitterbug in the '40s, to Rock and Roll in the '50s, and to East Coast Swing, West Coast Swing, Jive, Shag, and others. In round dancing, the dominant swing rhythm is East Coast or triple swing. However, the figures that we use have mostly come from International-style, competition Jive, and most of our cue sheets identify these dances as "jives." Many figures are written to span a measure and a half with a rock, recover, and two triples. Another group of figures span two measures with a one, two, and a triple, one, two, and a second triple. There has been some effort to distinguish between triple-swing and triple-jive. Swing is slower, and the triples travel more with a side/close, side and a count of 1&2. An "&" divides a beat in half, so the timing of a swing triple is half beat, half beat, whole beat. These triples might make you think of cha cha, but this is rock-and-roll music; the music doesn't say "cha-cha-cha." Swing can be quite easy-going, loose, and rag-doll-like. Jive is tighter, faster, bouncier, has more knee action, and the triples are more in place with a step/close, side and a count of 1a2, with sharper and briefer second step. The timing of a jive triple is 3/4 beat, 1/4 beat, whole beat. Another view from a ballroom expert and for those who like the picky details says that both the swing and the jive triple really have the timing of 2/3 beat, 1/3 beat (of a triplet musical figure), whole beat. I don't know. My ear is not that good. Both swing and jive make use of the Latin hip at the end of the triple: step/step, side/hip. Eight steps over six beats of music or ten steps over eight beats always puts you back with your lead foot free, so it's easy to move from figure to figure. Almost any figure can follow almost any other. When the tempo gets faster, there isn't time to fit those triples in, and we switch to what is called "single swing." Each 6-count figure becomes, rock, recover, step, step (q,q,s,-; s,-,), four steps over the six beats of music. Less common is "double swing" with six steps or actions over the six beats: rock L, recover R, press L, step L; press R, step R, (q,q,q,q; q,q,) (of course, the woman begins with her right). Although this step pattern works fine with the slower swing music that is common in round dancing, with the faster tempo of true jive, you won't have time. If you are doing a fast jive, dance the triple almost in place. Keep softer knees and stab the ball of the foot into the floor -- stab, bum/bum, stab, bum/bum; -- little steps. You will exhaust yourself if you try to reach out for a real side step. In addition to side chasses, we dance forward, back, forward and back locking, and turning chasses. During a turning chasse, we can turn gradually over the three steps of the triple, but our jive will be crisper if we concentrate most of the turn during the first or last step of the triple, spinning on the ball of the lead foot. In a facing position, step side/close, sd/cl, sd/cl, sd; In When Will I Be Loved by the Moores, we start with lead feet free; cross in front unwind step side and close lead feet; continuous chasse to RLOD; whip throwaway facing wall;; to an american spin. Beginning in an open facing position, rock back L (woman back R), recover, and chasse small steps fwd/cl, fwd; to closed position. As the figure name implies, you are "linking" yourselves more tightly into closed position. Note that the link is a one-measure figure. More common than the Link. In an open facing position, rock back L (woman back R), recover, and chasse small steps fwd/cl, fwd; sd/cl, sd, to closed position. Again, you are "linking" yourselves more tightly into closed position, but this time you end up with lead feet free. This figure can turn up to 1/2 RF to end in CP facing wall unless otherwise cued. For instance, you might begin in left open facing position LOD and link to CP facing wall. The name of this figure could be misleading. The standard fallaway rock is 1 1/2 measures, and this one is only 1 meas. But the name follows in the tradition of "new yorker in 4" in cha, and in a dance the next cue will come quickly to tell you not to linger the additional half measure. The "rock, recover" part of this is the fallaway. The two triples make up the throwaway part. In a Throwaway Overturned, the lady dances 2 chasses turning LF to end in a figurehead position. At the end of the measure, both are facing LOD. The man's lead for the overturn is gentle CW rotation of the lead hand as if to a hammerlock behind the lady's back. In My Baby Just Cares For Me by Clements, there is flicks into break;;;;; throwaway overturned; lady swivel to chicken walks 2 slo; 4 qk; chg R to L.
Of course, the first two steps constitute the "slingshot." We stretch apart and then recoil together into the throwaway. May be done in other facing directions. The man is dancing pretty much in place, facing the wall, while the woman is running in front of him to his left and then back to her starting position again. May be done in other facing directions. Arm work is optional. May begin in any facing direction. In a facing position, rock back L (woman back R) to semi-closed, recover R to face, side/close, side turning LF 1/4 sort of like starting a Pickup; and side/close, side again turning LF 1/4, The full figure makes a turn of 1/2, perhaps from facing wall to facing center. In a facing position, rock back L (woman back R) to semi-closed, recover R to face, side/close, side turning RF 1/4 sort of like starting a Maneuver; and side/close, side again turning RF 1/4, The full figure makes a turn of 1/2 perhaps from facing wall to facing center. Again, we can distinguish between jive and swing styling. The above is more "swingy. "A more "jivey" rendering concentrates the turn on beat 4. During the first chasse, step/step in place, and then step, lift, and pivot 1/2 to face center. Do the second chasse facing center. If the tempo is fast, don't try to progress on the chasses. Stay low and jab in place. Rise for the pivot. Lower again for the second chasse -- jab/jab, jab. There is no rock, recover to fallaway position here. In a facing position, step side/close, side turning RF 1/4 sort of like starting a Maneuver; and side/close, side again turning RF 1/4. This is a progressive wrapping into your lead arms as you roll down line and then unwrapping as you roll to reverse again. The figure can begin in other positions, such as semi or butterfly, and it can progress in any direction. Sometimes a choreographer will insert two rocks or lunges in the middle of this figure (see example to right), rather than the standard one rock (the arm work can be even "cooler" then). This is a pretzel turn interrupted by two additional "lunge, recover, chasses," one to LOD and then a second one to RLOD, before we do the "real" lunge to LOD and unwrap. In closed position facing wall, rock back L (woman bk R) to fallaway position, recover R to face, step sd/cl, sd turning 1/2 RF (woman 1/2 LF) keeping lead hands joined; chasse L/R, L turning up to 1/4 more. You might be side to side both facing line with your lead hands joined behind your backs and your trail arms extended forward, but I think most will be in a V-position, man facing line and center and woman facing line and wall. This gives the next step a contra look. On beat 3 of the second measure, we begin the first of our two "interruptions." Cross the L in front of the R (woman XRIF of L) with a little lunging action and extend the trail hand forward with palms down. Or snap your fingers, or make any other cool hand gesture that occurs to you. Try to match the beat and match your partner. Recover R beginning to turn LF (woman turn RF), and chasse L/R, L, in a back-to-back position, moving toward RLOD. This feels like you are continuing your pretzel turn, but remember, this is an "interruption." Don't unwrap. Only turn enough to be positioned back-to-back, and as you do this chasse, change hands, taking trail hands. Now dance your second "interruption." Cross the R in front of the L (woman XLIF of R), lunge toward RLOD, and perform your hand gesture with the lead hands toward RLOD. Recover L trng a little RF to back-to-back position, change to lead hands joined, and chasse R/L, R toward LOD. Now, we can finish the pretzel turn. Cross the L in front of the R (woman XRIF of L) with a little lunging action and extend the trail hand forward with palms down. Recover R beginning to turn LF (woman unwind RF), and chasse sd L/cl R, sd L turning to face partner still holding lead hands, sd R/cl L, sd R to closed position again. This figure is like the first half of a pretzel turn, but you don't maintain the lead hand-hold and there are three triples instead of two. In closed position facing wall rock back to fallaway position, recover to face, step sd L/cl R, sd L turning RF 1/2 to back-to-back position (woman steps sd R/cl L, sd R turning LF); sd R/cl L, sd R turning 1/2 to face, sd L/cl R, sd L; Often you will be cued to chasse roll back toward reverse. Or, you might think of these triples as something like a two-step face to face, back to back, and then around to another face to face. May begin in other positions and may progress in opposite direction with opposite footwork and turn. I'd better start this with a disclaimer. We've never danced the standard figure, and every description we've heard or read is different from the previous one. But I want to be complete, and it is a Roundalab Standard. Let me try and maybe you will be good enough to give me a critique. Start in a handshake position, perhaps facing wall. In the first measure, rock back L (woman bk R), recover R (woman rec L), chassé L/R, L beginning to turn LF and releasing handshake for right-wrist-to-right-wrist contact, woman's wrist on top (woman chassés R/L, R and turns a little to the right); At the end of the first measure the man is facing line and wall, the woman line and center. 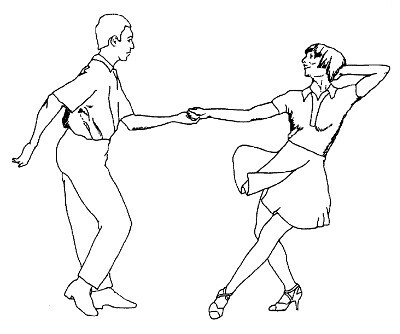 During the second measure, the man raises his right arm a little to continue the woman's turn, he completes his 1/2 LF turn and steps R (woman steps L) to finish that step in a back-to-back position. Man will touch left wrist to woman's right wrist now and press down a little to turn her. Both turn 1/2 to face, and man steps side L (woman sd R). On the third beat, he uses his right wrist to press down on her left and turns 1/2 LF and steps side R (woman turns 1/2 RF and steps side L). Finally, he uses his left wrist again. Both turn 1/2 to face and step side. Of course, this is the actual "turnstile" movement. We are rolling to reverse in four steps and making two complete revolutions. The revolutions I am describing above are individual half-spins — spin and face away, spin and face partner, and so on. In addition, you might be turning as a couple to the left, so each of those four steps is not toward RLOD but on a small arc, the circumference of of a circle on which the two of you are standing. The choreography will have to specify, but at the end of measure two, you could be facing partner and LOD, or you could have turned as a couple 1/2 and so be facing partner and COH. We end the figure with a side chassé R/L, R (woman L/R, L). There might be a temptation to make these turns double underarm turns, but you don't join hands. Keep your arms stiff and down. Each lead by the man stays below the horizontal — it's just a nudge. Think "penguin arms." As Meredith and I play with this in the kitchen, we seem to contact elbows as often as wrists. The figure does seem to flow more smoothly if you stay close. Another feature of styling that is important is sway toward your partner during measure two. As you take the first step, incline toward your partner and touch man's right shoulder to woman's left. As you turn the turnstile, roll across the top of her shoulders, back-to-back, and touch man's left to woman's right. Engage his left and her right arms, roll, and engage his right and her left arms, leaning toward partner. This feels odd. Normally, we try to keep our toplines apart. We have the option to turn more than two full turns. You might begin with a rock apart, recover, and chassé with a half turn for the man and a full turn for the woman to end in Woman's Tandem, both facing COH. Then the "turnstile" would involve L/L wrists to Tandem wall, R/R wrists to Woman's Tandem COH, and repeat. The last chassé would involve a half turn for the man and a second full turn for the woman. If you include rotation for the couple, again in measure two, you would gradually turn LF to end facing LOD or even COH before the final chassé and spin. Finally, let us note that at full jive tempo, that turnstile is really fast. Chris and Terri Cantrell described some choreography that they once did in which the middle "turnstile" action was done at half speed — each step used two beats for a total of two measures. That would certainly take some of the violence out of the figure. As I say, we have never encountered the standard figure in a dance, and we have only just been introduced to the "modified" Turnstile in the Blackfords' Cat Daddy. This one begins in Left Open Facing Position with a rock apart and recover to three turning chassés, man turning RF and woman turning LF, 1/2 turn on each triple, progressing straight toward RLOD to a continuous chassé (123a4; 1a23a4; 1a2a3a4;). The form of the Turnstile is certainly not fixed. It might even be better to think of it as an action that can be used in lots of different ways in different figure combinations, much as a Spiral is used. Blending to semi-closed position facing LOD, rock bk L (W bk R), rec, sd/cl, sd beginning to turn LF (W dances sd/cl, sd, spinning RF under his lead hand on the third step of this first triple). We end with a fwd/cl, fwd (W bk/cl, bk) to left open facing position DLC. Note that the link here is a fallaway rock, recover, hinging open to SCP. In general, this "hinging link" leads the lady to move to the man's left. A link that rocks straight apart, recover leads the lady to move to his right, as in a change left to right (below), neck slide, rolling off the arms, or lindy catch. Of course, we can begin and end in other positions and in other facing directions, and we often under- or over-turn the figure -- for instance, the man might start facing wall and end facing LOD or COH. Listen to the first directional word. The man can focus on the word right (as in right to left) and know that he needs to do a fallaway rock, moving to his right. This will aim the partnership in the proper direction and get the woman moving toward the man's left side. If he hears left first, he rocks straight back with a basic rock, not moving right but staying a bit to the left of the lady. As he raises his lead arm, she will be directed to his right. Or the woman can hear the word right and know she will turn right-face under lead hands. If the first directional word is left, she will turn left-face. These directions guide her to the proper side of the man. Or the man can focus on the second directional word (as in right to left) and take her to that side. Left -- direct her past your left shoulder and toward your left hand. Right -- direct her toward your right side. We can't just hear these two cues and think generically, "okay this is where we sort of do an underarm turn and change sides." We have to hear that there are two different cues and then dance different figures. In essence, she does a LF underarm turn on the first triple and he does a LF underarm turn on the second triple. May begin in butterfly. May be done in other orientations. Start in handshake position facing partner. This is a two-measure figure consisting of four triples. First, the man triples in place and leads the woman in a full turn LF under joined right hands. The hands go up and down in a complete CCW circle over your heads and back to low handshake. He steps in place L/R, L, and she spins in place R/L, R, During beats 3 & 4, she steps in place L/R, L; and he spins RF R/L, R; under joined right hands. The second measure repeats the first. This is the Roundalab description. URDC describes a three-measure chopper that begins and ends for both with a rock, recover. I have also seen a one-measure "chopper ending" and a one-measure "chopper 4" that was not only done on an even count (man steps L, R, L, R; and woman spins on step 1 and man on step 3), but the woman spins RF and the man LF. So there is some variability out there. In facing position, lead feet free, step side L with a pushing action (woman sd R)/sd R, close L/cl R, sd L/sd R, cl L/cl R; Often the hands go out with the feet and back to the body as the feet come in. It's a little difficult to keep this figure from becoming a pair of "jumping jacks." Try not to move up and down, but keep the upper body still. These are also known as "Quick Side Breaks." Slow Side Breaks are danced a/slow, -, a/slow, -; and you might hear cued Side Breaks, two slows and four quicks (two measures total). When hopping on the R there is slight sway right and when hopping on the L there is slight sway left. May be done with same or opposite footwork. If you want to make this figure more "jivey" and less "swingy," take out the progression and focus more on lift and on body rotation.As you triple with your lead feet, rise and turn toward your partner. In place, jab/jab step/swivel to face. As you triple with the trail feet, swing the right hip (W left hip) thru and turn a little away -- triple up and face, triple down toward line. Often, we do jive walks and then swivel walks. This jive styling gives the jive walks the look of swivel walks -- with triples, we are swiveling toward partner and away. In semi-closed position, step forward on the lead foot and lead the woman to swivel just a little LF, -, fwd on trail feet and woman swivels RF, -; With each step, she turns her knee in a little and steps one step in front of the other. With your frame, you are rotating her just a little: left, right, left, right. Both could swivel: in, out, in, out. You could do this figure in open position. As with the jive walks above, up-down motion is a jivey sort of addition. The man steps down line, rising, and leading strongly with the left shoulder. She steps, rises, and turns sharply toward him. Then with the trail foot, he crosses in front and falls or relaxes a little. She steps forward, falls, and turns toward line. Repeat. The man is almost doing a Limp. The woman is doing the swivel walks. In open facing position, line of dance, lead hands joined. The man walks backwards four steps, and he leads the woman to walk forward, gently pulling her and causing her to swivel a bit with each step. She steps with her right and swivels the foot a bit right face, turning the toes out or really turning the heel in, then step left and swivel left on ball of foot so toes point out, and so on. He leads her to make these little swivelling turns by turning her lead hand left and then right. He turns the hand in the direction that he wants her to swivel. I think most men dance this figure with soft knees and maybe a kind of "coaxing" attitude: "Come on, baby." and the woman leans back away from him with something of a resisting attitude: "No, I'm not giving in easily." She might be a little haughty. You have to play around with that sort of styling, but do try for some kind of "attitude." Don't just walk. Think dominant "cocky" thoughts. Push her ahead of you— relentlessly, inexorably. Of course, the hand styling may vary. Another common style is to put the right hand on your hip and "jazz" only the left hand. May be done in 4 quick steps (qqqq;) or in other timings. May be done by the man. May begin with either foot. In semi position, line of dance, lead foot free, step forward with a straight knee and leaning torso forward. Then close trail foot with soft knee and leaning torso backwards. Keep your eyes up. May be begun with trail foot. Often done twice. In butterfly position, rock apart on lead feet, recover on trail crossing a little in front and progressing down line, rock apart again progressing, recover; May also begin with the trail feet and progress to reverse. Point forward with the outside edge of the foot in contact with the floor. Then take a small forward step with that same foot. May be done with either foot and in almost any position. Often, we do a series of point steps in BFLY or SCP. In such a series, you may shape and look in the direction of the pointing outside foot (e.g., LOD) and then shape toward partner and look away from the pointing inside foot (e.g., RLOD). The shag is a combination of steps and side kicks and is not well defined in round dancing. You might be facing and step side on the lead foot, rise on that foot and kick the trail foot to the side, close the trail, rise and kick the lead; close the lead, and step in place, You could also start with the trail feet or use same footwork. May be done in any position. Again with lead hands joined, facing line of dance (woman facing reverse), rock apart L (woman apart R), recover R turning LF, step L/R, L leading woman to step forward R/L, R spinning RF a full turn to face the man and wall; The man dances one more triple: R/L, R turning LF to face reverse, and the woman dances fwd L/R, L turning LF to face man and line of dance. End in left open facing position, reverse line of dance. In left open facing position LOD rock apt L (W apt R), recover R releasing hands and spinning 1/2 RF to turn back on lady (W recovers and does not turn). We are in man's tandem RLOD. Triple in place LRL and on 3rd stp of the triple spin 1/2 LF to face partner again (W triple in place putting her R hnd on his back and pushing off on her 3rd stp to spin a full turn RF. The man triples in place RLR (W LRL completing her turn to face. Endleft open facing position LOD. May be danced in other facing directions. In butterfly position, rock apart, recover, fwd/cl, fwd woman sd/cl, sd turning LF 1/4 with arms out tilted into the turn lead arms low; sd/cl, sd turning another quarter with arms out but more level, Often repeated back to starting position, or do a windmill over and a spanish arms back. The windmill (above) can be thought of as a "reverse" or left-turning windmill, and at a first approximation, the sugar wheel is a "natural" or right-turning windmill. However, the styling of the sugar wheel is sharper than that of a windmill. Where the 1/2 turn of a windmill is begun on the recover step and is then distributed over both triples, the 1/2 turn of a sugar wheel is designed to occur on the third step of the first triple only. Specifically, in butterfly position M facing wall, we rock apart on lead feet, recover R (W rec L), and small triple adjusting to butterfly banjo with pressure thru the lead hands causing both partners to spin 1/2 RF on the last step of that triple ending in butterfly sidecar position M facing COH (W fcg wall). Finish the figure with a small triple to face partner. In Kansas City by the Rumbles, we do a triple wheel to face wall;; ,, spanish arms twice,;; ,, basic rock,;; sugar wheel twice;;; into a change left to right to face center. Note that both turn under joined R hands, woman a bit ahead of man. Couple may end in starting facing direction or may change facing direction. This figure is not at all standardized. The important component is the pelvic bump. At first, the name Triple Wheel makes you think of three things, and yet the figure uses four chasses. Think of the figure beginning with a rock, recover, and ending with an American Spin ending, with three back-touching chasses between. Usually you wheel as a couple 1/2 over the three triples. A Triple Wheel 5 would wheel one full turn. A Triple Wheel 7 would go around 1 1/2, but as the figure is extended, the cuer had better state the ending direction. In a facing handshake position, rock apart L (woman apart R), recover, fwd R/L, R turning 1/4 RF wrapping woman into R arm (woman turning 1/4 LF into man's R arm); fwd R, fwd L wheeling 1/2 RF (woman bk L, R), triple in place R/L, R turning 1/4 RF (woman triple and spin out RF to face man; As a couple, you will make one full turn. The lower body should pendulum back and forth under a still upper body as on a rocking boat. May be done in any position with either foot. Often this figure will be cued with the number of triples to be danced, e.g., "three sailor shuffles" takes 1 1/2 measures of music. Larry Monday and Gladys Gunter, in their Little Shoes, did a shoulder roll lady transition to a riverboat shuffle in tandem position. I'll let you look at page 2 of that cue sheet yourself. I think I've seen the coca rola done more often as a one-measure figure than as a two. In closed position facing reverse and wall, XRIB of left with toe out [foot rotated CW] (woman fwd L toward man's right side) and begin turning RF, sd L continue turning strongly (woman fwd R between his feet), side chasse remaining in closed position; May begin in other facing directions. This is a spot turn for the couple of up to one full turn (no progression) during the first two steps. The man must step well under his body with soft knees. May begin in other facing directions. These "whip" figures are usually preceded by a Link: rock apart on the lead foot, recover, and then triple beginning to turn RF; This sets up the actual "whip" turn. But we don't have uniform consistency. Sometimes a "whip" figure will be choreographed as a two-measure figure as if the link is part of the whip turn. Again, sometimes the preceding Link is choreographed as though it were part of the whip figure (see Whip Turn above). In closed or left open facing position, rock forward L toward wall (woman bk R), recover R raising lead hands to lead a reverse underarm turn, step sd L/cl R, sd L turning 1/8 RF (woman turns 7/8 LF under lead hands remaining in circle of man's R arm) to end in closed position facing reverse and wall; XRIB of left (woman fwd L toward man's right side) and begin turning RF, sd L continue turning strongly (woman fwd R between his feet), side chasse remaining in closed position; May begin in other facing directions. This is a big figure—five measures. There is an even-count set-up and then four measures of real performance. Simplified, we kick/ball change, circle two; sit/ball change, circle two; and repeat. Now, kick L and look toward LOD (woman kicks R and looks toward RLOD)/ rotate RF and step fwd L to RLOD (woman XRIB of L and turn to face LOD), fwd R (woman fwd L), fwd L small step and turning RF, small step bk R (woman close L) turning to face LOD and partner and releasing to a left open facing position again; You have danced a complete circle over the first two measures. Finish the figure by repeating measures two and three, as described above. Again, those two measures are almost a kick/ball change, circle two; and sit/ball change, circle two. Do it twice. You will go around a total of 2 1/2 times and end the figure in L-position, man facing wall and woman facing line. Total turn is 3/4 RF as a couple. We do a small kick forward/close on ball of that foot, close other foot, (two wt changes). A little more jivey look can be had if you open your hip and kick not straight forward but forward and away from the body. You can dance this figure with either foot. This is an unphased figure that I have only seen in Sunflower, but since this dance was just elected to the URDC Hall of Fame (2006), we should look at it. Let's pause. Notice that we have danced the first two measures. It was a rock, recover, touch, step; kick, touch, and a side chasse to reverse line of dance. We will repeat this pattern with two kicks and then with three kicks for a total of 7 1/2 measures. In the timing to the left, I have given the "kick, touch" counts in garnet. Let me admit that the cue sheet does not include the first "rock, recover, touch, step" within the figure but cues it separately, and it does include a final "rock, recover" for a total of 7 measures. This is a two-step figure. In butterfly position and standing on the right foot (woman left), swivel RF (woman LF) and touch the free toe to the floor, swivel LF and touch the free heel to the floor, cross LIF of right and take weight, -; May be done with the trail feet. Only one weight change. In butterfly position, swivel 1/8 RF on R (woman LF on L) and touch free toe to instep of supporting foot, swivel 1/4 LF on R and step small side step L, swivel 1/4 RF on L and touch R heel to floor, swivel 1/4 LF on L and cross right in front of left (woman XLIB of right) to contra banjo position; In the second measure, you essentially repeat the first: swivel 1/4 RF on R (woman LF on L) and touch free toe to instep of supporting foot, swivel 1/4 LF on R and step small side step L, swivel 1/4 RF on L and touch R heel to floor, swivel 1/4 LF on L and cross right in front of left (woman XLIB of right) to contra banjo position; Only two weight changes per measure. One entry sequence begins in left open facing position RLOD with a change places left to right into the triple travel with roll. The first chasse of the change places left to right is used to blend into the right hand star position, and the second chasse of the change places becomes the first chasse of the triple travel with roll. The figure may begin with the man facing wall and will then progress to RLOD. A styling option that many consider to be more gently flowing is to use diagonal facing directions and to underturn each of the four turns within the figure. So, in the first right hand star, the man faces DLC and the woman faces DRW, and that initial roll becomes only 1 1/4 RF (instead of 1 1/2). In the first of the three central chasses, he faces DLW, and she faces DRC. To do the second of the three central chasses, both turn only 1/4 LF, rather than 1/2, and he faces DLC again (rather than COH). Turn 1/4 RF for the third of the central chasses, and he will face DLW and she DRC. Finally, roll 1 1/8 LF (instead of 1 1/4) to Left Open Facing Position LOD for the final chasse. Notice that this figure turns from semi to reverse semi and back to semi again. Sometimes the figure uses half-open and left half-open, open and left open, or side-by-side positions. Another variation is to use a slight hop on the supporting foot when flicking the free foot and again when closing the free foot to the supporting foot. Instead of simply closing after a flick, you may also spring onto the free foot, ball-flat, in front of the supporting foot with a cut action. This is a samba figure done in closed position, lead hands joined low at hip level with man's palm up and woman's palm down. Keep some weight on trail feet throughout. Press L heel fwd (woman R toe bk) shifting partial weight/recover to trail foot, press L toe back (woman R heel fwd) again shifting partial weight/recover to trail foot, heel fwd/rec, heel fwd/rec; toe bk/rec, heel fwd/rec, toe bk/rec, toe bk/rec; The lower body rocks fwd and bk but the upper body remains still. Actually, I've never seen it danced in this syncopated, two-measure form. We can do it in samba because the tempo is much slower, but at jive tempo, I'm not sure this is possible. In jive, the marchessi is danced as an even-count, four-measure figure: 1234; 1234; 1234; 1234; It might be cued as a "slow" marchessi, but even slowed in this way, it moves fast enough so that actual weight changes can be difficult. It can be thought of as a "come from behind american spin." This is a long figure (five measures) but in a nutshell, it consists of a rock-recover, three point-steps down line, four kick-steps to line, to reverse, to line, and to reverse, and finally a lunge thru to line like a chair, hold, and ball-change. In jive, the point-steps and kick-steps are quick and so constitute "flicks" of the foot. The last lunge and ball-change is the break. Note that you progress down line on the three point-steps but you do not progress during the kick-steps. This figure can start in semi-closed or butterfly position, and it can be done in other orientations, e.g. to reverse. You might be in a side-by-side position, both with the left foot free. Flick the left foot forward, close the left to right, flick the right foot forward, and then touch the right to left; In the second measure, point the right back on the first beat, cross the right in back of the left/and kick the left forward in the second beat, bend the left leg so the upper leg is parallel to the floor on the third, and point the left back on the fourth; You may do this sequence with a little lifting action on each step. You might be in tandem position, both with left foot free. Step forward L, recover R, back L, rec R; fwd L, rec R, bk L, rec R; Do this one with a swaying Cuban hip action. Facing partner, no hands joined, raise arms to shoulder height. Upper arms are parallel to floor, forearms are vertical, and elbow is at 90 degrees. Make two fists, with thumb side toward you and little-finger side toward partner. Now, step L (W R) and jerk fists back twice quickly (flex elbows). Step R and jerk fists forward twice quickly (extend elbows). Small jerks; don't hit your partner. Facing partner, no hands joined, step side L (W sd R) to split weight and "swim" toward partner with trail arms, then lead arms -- two crawl strokes. Maintain split weight and repeat. Facing partner, no hands joined, and with split weight (weight on both feet), grab the bridge of your nose with either hand and raise the other arm straight up beside the head. Wiggle your hips and slowly lower while waving the free hand. Continue to hold your nose as you slowly straighten your legs and rise.